The following products are limited and availability is not guaranteed. These are not damaged items, however they may be discontinued. These fine mesh grids are carefully checked. 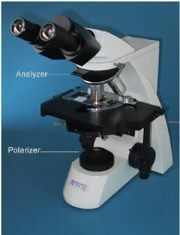 They are suitable for the low magnification range of a TEM. Available as a sandwich in a folding 3.05mm mesh grid, or in a square mesh 25 mm. 1¼" Diameter Double Ball Joint. Links swivel mirror for viewing. Telescopes from 4½" to 18½"
Vented and insulated HDPE cover. Unbreakable, chemically resistant, and will withstand temperatures from -196 to 100°C (-321 to 212°F). Polystyrene. External dimensions 128 x 86 mm. These precise capsules are made from stainless steel and have a fine mesh bottom. 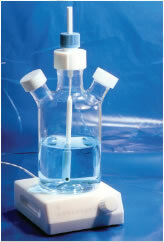 They can be used as routine or micro specimen holders. They measure 25 mm in diameter and are 6 mm deep. These molds are made from aluminum, 1½" high. BLACK-ON-WHITE (black letters; white background) dry transfer lettering sheets. Each sheet is 8¼" x 11¼". For outstanding image stability and near-photographic quality continuous tone thermal prints. Features excellent color reproduction, including superior flesh tones and durability. Suspends from the ceiling for direct or indirect illumination. Provided with support chain and 6-foot, 3-wire grounded cord set (without switch). Intended for connection directly to a grounded outlet with remote switch control. Holds a 10x12 safelight filter (not included). Used with bulb (not included) of recommended wattage (7½, 15, or 25 watts). Lamp can also be positioned on wall, table, or workbench (using the bracket for the KODAK Utility Safelight Lamp). Scientifically designed for safelight lamps. Provides maximum safe illumination, when used as directed, plus offers protection from white light when using sensitized materials. OA / greenish yellow – For black-and-white contact and duplicating materials and projection films. 2 / dark red – For fast orthochromatic materials, some green-sensitive x-ray films, KODAK EKTALINE Papers, and KODAK orthochromatic LINAGRAPH Papers. 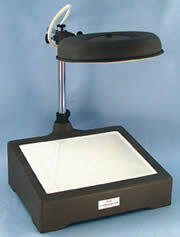 Mini 1.75X magnifier facilitates your viewing for the mini light box. This dial thermometer, with a 0°C to 300°C range, fits directly into the top plate and measures the surface temperature. 72344-10 100 6.8 680 50 to1200 7.25" x 7.25"
The Bio-Solventor Pen will mask information marked with the Bio-Imager Pen, if corrections are needed. Machined from solid Aluminum. Comes with set screws and a hex key. Used to hold the Heat Extractor in a freezing agent (i.e. LN2) in the Gentle Jane Snap Freezer. (Heat Extractor not included). For routine tissue samples, this standard blade offers an unsurpassed level of quality at an affordable price. Made from stainless steel. It is fully perforated allowing for free movement of fluids. It comes with a snap-cap which provides positive enclosure. Measures 35 mm (D) x 70 mm (H). When lab equipment needs a lift! This Multi Jack is ideal for any laboratory supporting various types and sizes of glassware, apparatus, and instruments at specific heights as is required by specific work set-ups. 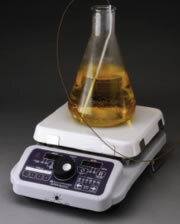 Special Culture Flask made from borosilicate glass and "PTFE"
For all applications where gentle stirring is required, such as biological suspensions and micro-carrier cell cultures. 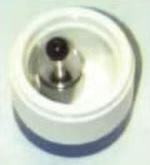 The unique stirring action uses a flexible "PTFE" shaft driven through a fully encapsulated rare-earth magnet to give even and complete mixing throughout the liquid. The height of the shaft is adjustable. Contact materials are "PTFE" and borosilicate glass only. The glass vessel has two side-arms and the base is intended to aid mixing. Recommended for use up to 120 rpm max. Modular MSI-150 is the most versatile 150W halogen, high intensity fiber optic system. Its quick-change lamp module permits easy access and fast replacement. 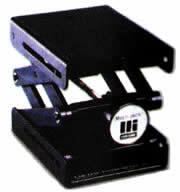 MSI-150 includes both a solid state dimmer and a mechanical diaphragm. The system allows users to select optimum light output (EJA) or maximum lamp life (EKE). Forced air, fan cooled with voltage trimmer adjustments. The lightweight MSI-150 accommodates single or bifurcated fiber bundles, as well as ringlights. A combination of an illuminated magnifier and a light box. It offers you a work station that is convenient for the inspection of biological and medical specimens, photography, and specimen orientation. The BC Upright Compound microscope is designed to perform in a demanding research environment and incorporates advanced technology into a durable, cost effective solution for your microscope needs. Eye pieces – 10X wide field; Focal Length 25mm, Field Number 22 mm. Microscope Includes: dust cover, immersion oil, two color filters, spare halogen lamp and fuse; phase centering telescope & green filter. With 4x achromat objective, and 10x eyepiece with standard unlighted stage for use outdoors or with lamp. Includes table top tripod, battery, manual and demonstration slides. With any of the following objectives. These are RMS / DIN standard objectives which offer improved optical performance. With this high quality eyepiece to increase magnification. Order individual parts applicable to your unique needs. Rigid dust covers are great for use with various instruments. They are strong and lightweight and they are available in either round or rectangular shapes. Rectangular Cover: A versatile instrument cover, best suited for balances. Made from clear cellulose acetate with a handle at the top and reinforced aluminum band at the bottom. Measures: 15¾" L x 10⅞" W x 10⅞" H.
Round Cover: Rigid and perfect for the microscope. It blocks out dust and corrosive fumes. They are made from clear cellulose acetate with a handle at the top and reinforced aluminum band at the bottom. 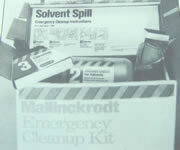 The items you need to clean up a solvent spill are locally organized in the Solvent Spill Emergency Cleanup Kit. The kit does not require time and patience because it's designed with the information as well as the kit. The simple step-by-step instructions tell you what to do and when to do it. The kit is sealed so you can be sure that all the items you need to clean up a spill of up to 1 liter will be there when you need them. One of the most important features of the kit is convenience. It contains step-by-step instructions, goggles, gloves, absorbent, neutralizer (when needed), scooper, brush, and waste bags, all put in one easy-access, flip top box. Cryo-Rack only. Accommodates 24 vials. Made from polypropylene. Neck diameter: 146 mm. Sturdy – Swivel Handle. These polypropylene fabricated dipping baskets withstands 180°F on a continuous basis or up to 200°F for shorter periods. Excellent chemical resistance. The basket comes complete with a swinging handle. Perforations are 1/8" (3.175mm) diameter on 21/64" (8.33mm) center. Dipping basket with lip edge. These pads instantly absorb 15 times their weight in most chemicals, solvents, and other liquids. 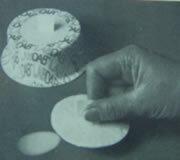 Pads are constructed from a unique polyethylene barrier that prevents skin contact with spilled materials. A convenient pinch grip tab on each pad makes it easy to use. The pads are supplied in a sturdy plastic dispenser box with an adhesive backing for mounting. 15 pads per dispenser. Tip measures: 0.17 mm W x 0.10 mm thick. Safely removes dust and static from negatives, slides, lenses, monitors, video cameras and more. A stainless steel rack with a fixed handle and grooves to take 76 x 26 mm microscope slides vertically for maximum use of space and solutions. This lighting device (EMS #67974) provides brightness around the base of the Macroscope-25. It can be moved vertically and positioned angularly to best highlight a specimen. Place prints from the RC Print Drying System into the angled, vinyl-coated rack to dry quickly and spotlessly, without heat. The rack holds up to eight 8 x 10" or 11 x 14" prints in any combination. The rack can be attached to the roller unit, set on a table, or hung on the wall. Cut-out Size 8¾" x 8¾"
To comply with the demands of immunogold labeling techniques, our Gilder copper and nickel specimen grid types, are now available with a gold plating (gilded) all with the same specifications as our regular grids. 24K gold is chemically deposited onto copper and nickel grids producing a uniform coating, with a gold thickness in the range of 0.10 to 0.25 microns. When doing autoradiography techniques, gilded grids have been used successfully for the localization and distribution of labeled compounds in specimens. The gold gilded grids decrease the risk of chemical reaction in many specimen treatment procedures, and is an alternative to the more expensive pure gold grids. Limited stock available. These grids will be discontinued once our stock is gone. Negafile offers special drawers for just about everything imaginable that might have to be stored in a microscopy laboratory. Each box is designed for long term storage under archival like conditions. Very often the advantages of wood over metal systems is overlooked, while the natural porosity of mahogany acts as a subtle kind of desiccator and insulator, providing an environment that is both dry and inert, the best kind of conditions for long lasting archival like characteristics of the system.